Werther International Inc., in partnership with FIAC, is committed to offering the most extensive and versatile line of high-efficiency Rotary Screw Compressors ranging from 3 to 100 Hp and producing from 10 to 560 CFM of air. We integrate the latest advancements in technology in the industrial rotary screw compressors and only use the best-suited components assuring optimal performance of our rotary screw air compressors and offer these features as standard equipment. Rotary screw air compressors are available as Compressor only, Compressor mounted on air tank, and a complete package of compressor with Air tank and Air Dryer. Rotary screw air compressors, also known as industrial rotary screw compressors, are a type of gas compressor that utilizes a rotary type mechanism. Werther's industrial screw compressors are used for large industrial applications because of the need for high power tools. Rotary screw air compressors also have a positive displacement compression system. Werther offers top rated rotary screw air compressors with a variety of air tanks! Tank Mounted Compressors 3 - 30 13 - 116 View Now! 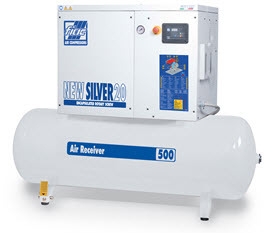 Tank Mounted Compressor with Air Dryer 5.5 - 30 20 - 116 View Now! 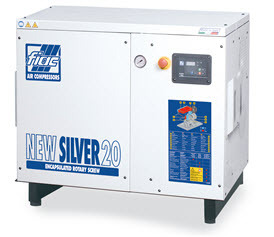 SILVER Base Mount Compressor 5.5 - 50 20 - 189 View Now! AIRBLOK Base Mount Compressor 10 - 125 42 - 494 View Now! Stand alone quiet rotary screw compressor models. Available with 2 ASME/CRN rated air tank options and range from 3 - 30Hp. 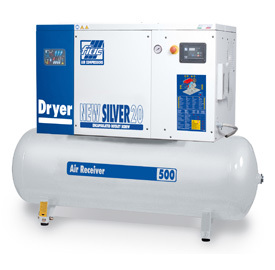 Available with 2 ASME/CRN rated air tank options, integrated refrigerated air dryer and range from 5.5 - 30Hp.